There are two forms of gastritis. These are known are acute gastritis and chronic gastritis. Acute gastritis may occur as a result of smoking, systemic infection, uremia, NSAIDS, alcohol and severe stress. Chronic gastritis can be further divided into type A chronic gastritis and type B chronic gastritis. Autoimmune disease is associated with type A chronic gastritis while Helicobacter pylori infection is associated with type B chronic gastritis. Acute gastritis is commonly present with hematemesis ( vomiting blood with coffee ground emesis characteristic), epigastric pain, vomiting and nausea. Chronic gastritis type B may remain asymptomatic while chronic gastritis type A may present with symptoms and signs such as pallor, nausea, vomiting,indigestion, mild cases of splenomegaly and diarrhea as well as fatigue. Chronic gastritis is associated with peptic ulcer ( mostly type B chronic gastritis). In term of treatment H2 receptor antagonist is considered in cases of acute gastritis. Vitamin B 12 supplement is considered in cases of type A chronic gastritis which may be given parenterally. Type B chronic gastritis is treated with the main aim to eradicate Helicobacter pylori. Triple therapy is considered ( metronidazole, amoxicillin or tetraycline , bismuth). Acute gastritis mostly presented with hemorrhages and purulent exudates with infiltration of the neutrophil. Petechiae, hemorrhages of the subepithelial and punctate lesion /erosion on the wall of the stomach is associated with acute gastritis. 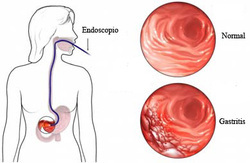 Chronic gastritis may present as reddened, thickened fold of rugal in the fundus of the stomach ( in chronic gastritis type A ) and antrum of the stomach ( chronic gastritis type B) . Atrophy of the gastric mucosal may occur in later stages. There is an increase risk in developing of gastric carcinoma based on the present of dysplastic cells/intestinal metaplasia. Chronic gastritis type A is present with hyperplasia of the G cells and chronic gastritis type B is presented with Helicobacter pylori in the microvilli with aggregation of lymphoid and infiltration of the lymphocytes. Chronic gastritis type A is mostly associated with the present of autoantibodies to the parietal cells which later leads to decrease absorption of the vitamin B12 ( vitamin B12 deficiency ) by the small intestine.This condition lead to pernicious anemia. Vitamin B12 deficiency is also associate with macrocytic anemia. 1.Dixon, M. F. “Progress in the Pathology of Gastritis and Duodenitis.” In Gastrointestinal Pathology, edited by Geraint T. Williams B. Sc, M. D. , M. R. C. P. , M. R. C. Path, 1–40. Current Topics in Pathology 81. Springer Berlin Heidelberg, 1990. 2.Dixon, M. F. “Progress in the Pathology of Gastritis and Duodenitis.” In Gastrointestinal Pathology, edited by Geraint T. Williams B. Sc, M. D. , M. R. C. P. , M. R. C. Path, 1–40. Current Topics in Pathology 81. Springer Berlin Heidelberg, 1990.